This week was more about quality over quantity. Coming off of the Pineland Farms 50 Mile, and 3 straight weeks of about 100+ miles, we shifted gears by lowering miles, and instead focused on some terrain-specific training, namely, hill and altitude work. Three days of training in Colorado (Friday, Saturday and Sunday) hosted by Jamie and David Donaldson, were absolutely amazing. I cannot thank them enough for being wonderful hosts and putting me through some incredible mountain training. I'll post more on the weekend, and a ton of pictures and videos during the week. 8.40 miles in 1:21:03 - Getting in 8+ miles the day following a 50-miler was an absolute challenge. Finished off a very consistent month of training, logging 424 miles. AM - 7.60 miles in 1:17:31 at Rockefeller State Park - Still feeling the effects of Sunday's 50-miler. Legs are heavy. I suppose the 4:50 AM start didn't help much either (nor did the recovery beers at yesterday's Memorial Day BBQ). AM - 6.00 miles in 55:16 on roads. PM - 5.10 miles in 44:21 at Rockefeller State Park. 8.00 miles in 1:16:00 at Rockefeller State Park. 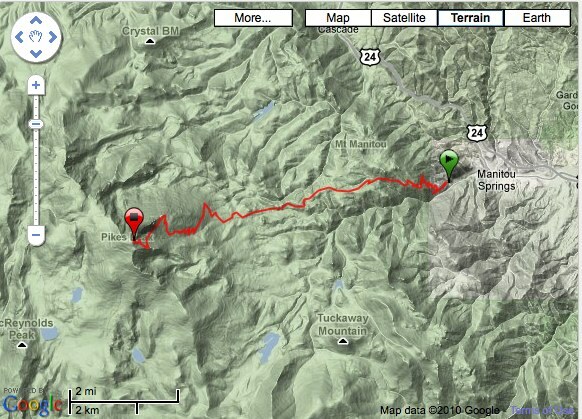 AM - 19 miles in 4:06:34 - Summit Mt. Evans - Ran the Mt. Evans Ascent with Brian Krogmann and Jamie Donaldson. Started at about 10,000 feet and ran 14.5 miles to the summit at 14,240 feet. Wind was absolutely insane at times. Ran the first 6-7 miles straight, staying within 10-20 yards of Brian and Jamie. With the increase in altitude, breathing became difficult, and was reduced to hiking and running for most of the remaining 7 miles. PM - 6.5 mile, 2 hour hike in Roxborough State Park to the top of Carpenter Peak. 12 miles in 5:46 - Summit Pike's Peak. 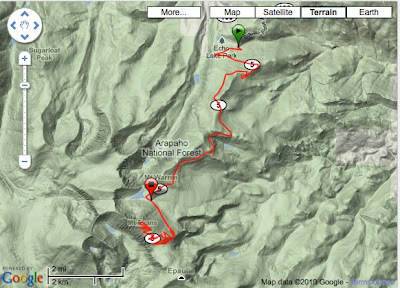 This was an insane trip up, with several rock scrambles and snow ridge crossings up to 14,110 feet. I admit, and as most people already know, I am a chicken and was seriously scared to death at times. The plan was to go and run the Manitou Incline, but we were pressed for time and wanted to make sure we visited Lisa Smith-Batchen during her visit to Colorado as part of her Running Hope Through America project. Beer Mile - despite a penalty lap for throwing up, still managed to finish in 4th place (out of 5). That was followed by the "Burrito Challenge", which didn't go so well. Then we went over to Red Rocks for a short stair workout. That is some quality training! Nice! See you next month at Badwater!